Hello and welcome back! Today I have a rainbow card to share with you. It is project using Taylored Expressions Rainbow Brights pattern paper pack. This card invites all of us to talk about all things important to humanity. From respect and love for each other, to attitude towards each other, to truth and reality, to be able to accept each other irrespective of one’s belief in terms of faith or orientation, to using force and violence, to protecting our planet and animals……. I can go on and on. I believe in knowledge and education is the key. The coloured chairs represent people. We are all different people and we need to chat about living together in peace. So let’s chat! Back to how I made this card, I wanted use the beautiful rainbow striped pattern paper from Rainbow Brights pattern paper pack as an accent on my card. The pattern paper by itself is beautiful but bright and busy, so I used very little of it on my card. But you can see how couple do stripes of the pattern paper makes the colours of the chair pop and brings the card together. I have a picture tutorial of how I made my card. Sit back and enjoy! 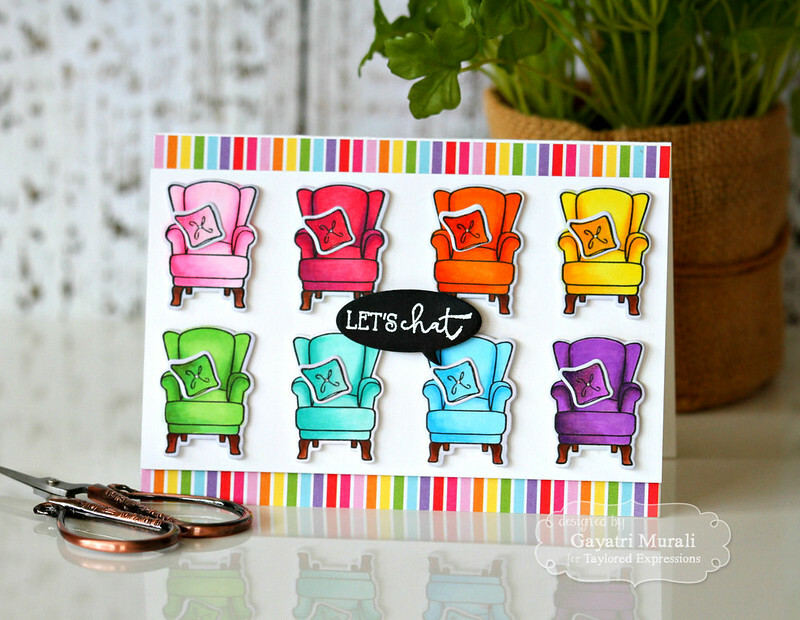 I stamped eight chairs from Sit and Chat stamp set on white cardstock, Coloured them all in rainbow colours using Copic Markers. Did the same with the cushions. I die cut all of them out using coordinating dies. This card is six by four and half inches. 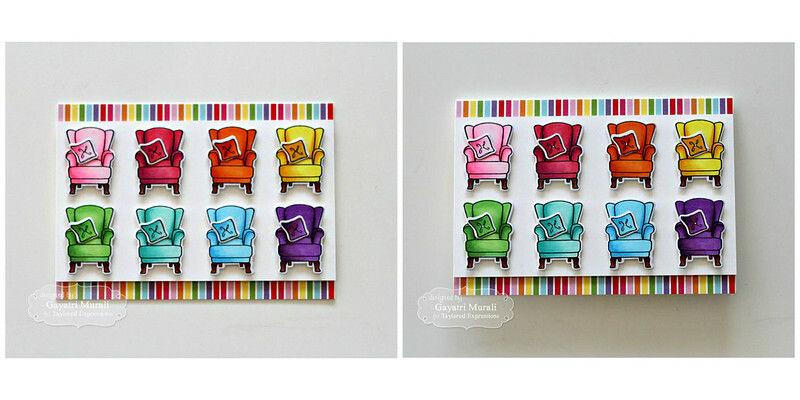 It is not a normal size card because I wanted to showcase all the chairs without over crowding them. I trimmed a white cardstock panel which is six by four inches upon which I foam mounted the chairs and flush glued the cushions on the chairs. On the card front, I adhered two strips of the rainbow striped pattern paper on top and bottom. I love this paper so much that I want to save them, hence I did not glue down the paper on the entire card front. 😉 The strips are good enough. I hoard things I love. Just saying! Then I adhered the chair panel on top of the card front using foam adhesives. 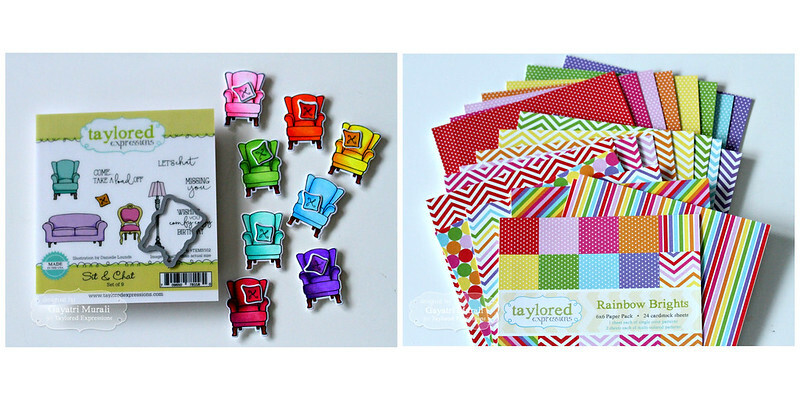 Now you can see how the rainbow pattern paper accents the rainbow chairs and makes the colours pop! The sentiment is from the same stamp set white heat embossed on Oreo cardstock and die cut using Say What? Conversation Bubbles die. I think the black speech bubble sentiment ties in with the black outline from the chairs. Hope you like my card and inspiration behind the card. All the supplies I used to make this card are from Taylored Expressions and are listed below. I absolutely love it Gayatri! 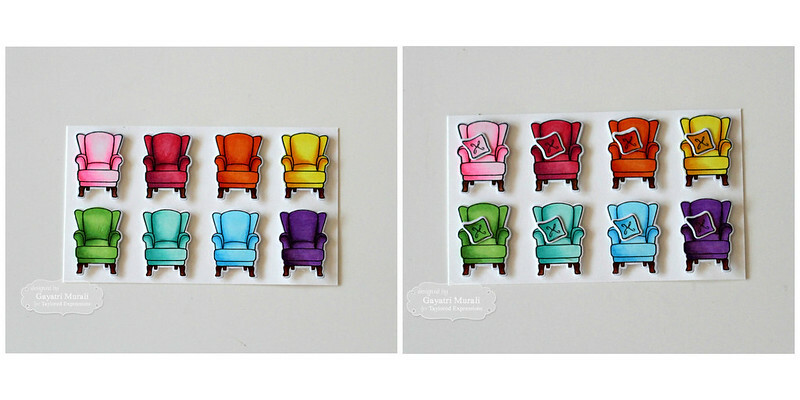 Just adorable those rainbow chairs. Hi, Gayatri! I love your card and just love each and every beautifully colored chair! Love the rainbow of colors! So clever with this adorable sentiment! Hugs! Such a fun card! Love the colors. So fun! Rainbow s and rainbow coloring makes me happy!